The Kennedy Center is a global Center based at the Brigham Young University campus and hosts six interdisciplinary majors and five minor degrees. The website provides information on academic and research programs and also hosts a rich data bank of all the most important lectures held at the Center. Since 1984, the Center has regularly promoted and recorded meetings for specialist discussion and debate, and these have been available on the website, in audio format since1984, and in video format since 2001. 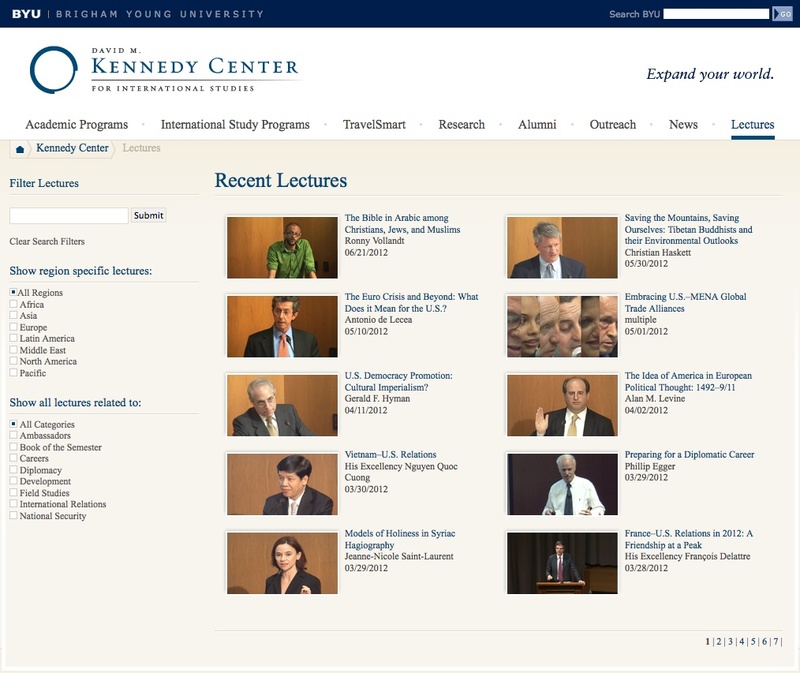 The Center’s database now contains more than 1,000 audio and video (more than 250 of the former and over 750 of the latter) documents, easily searchable using a basic search tool or by region (the geographical area the lectures focus on) or by category i.e., Ambassadors, Book of the Semester, Careers, Diplomacy, Development, Field Study, International Relations and National Security. All the lectures are freely viewable on the website and can be shared on other websites or through social networks; and all can also be downloaded as audio files. New videos have been regularly uploaded each month over the last few years. The simple structure of the website facilitates guided surfing, but the search tools are problematic as it is not possible to scroll through all the speeches chronologically.